During the summer of 2013, Donald Trump mused about whether President Vladimir Putin of Russia would meet him at the Miss Universe pageant in Moscow that fall. "If so, will he become my new best friend?" Trump posted on Twitter. 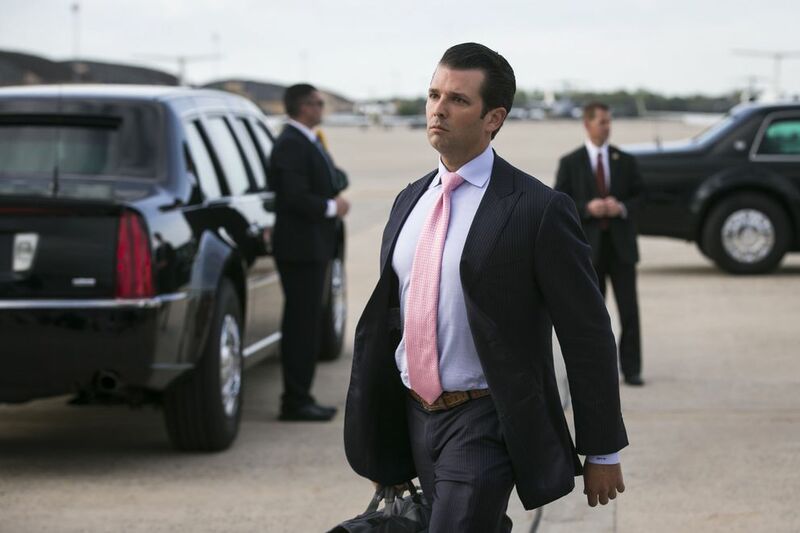 On Sunday, The New York Times reported that the president's eldest son, Donald Trump Jr., had met with a Kremlin-connected lawyer during the 2016 presidential campaign after being promised information damaging to Hillary Clinton. Trump's campaign chairman, Paul Manafort, and his son-in-law, Jared Kushner, also attended the meeting. The acquaintance was Rob Goldstone, a former British tabloid journalist and the president of a marketing company called Oui 2 Entertainment, who has worked with the Miss Universe pageant, according to two people briefed on the meeting. Goldstone told The Washington Post that he had arranged the June 9, 2016, meeting with Donald Trump Jr. on behalf of a client and had attended it along with the lawyer, Natalia Veselnitskaya. On Monday, Goldstone identified the client as Emin Agalarov, a pop star in Russia. Goldstone, who did not respond to an email seeking comment, has worked with Agalarov, who along with his father, Aras, develops major real estate projects in Russia. Trump, an owner of the Miss Universe pageant at the time, selected the Agalarovs to host the worldwide competition in 2013 in Moscow, and has discussed collaborating on a tower in Moscow with them. He also appeared in one of Agalarov's music videos, which featured pageant contestants. The beauty competition put Trump in contact with influential people in Russia, as he explained in a September 2015 interview on "The Hugh Hewitt Show." "I called it my weekend in Moscow," said Trump, who had announced his candidacy for president a few months earlier. He added: "I was with the top-level people, both oligarchs and generals, and top of the government people. I can't go further than that, but I will tell you that I met the top people, and the relationship was extraordinary." The Agalarovs appear to have a good relationship with Putin. Shortly before the Miss Universe pageant, Putin presented Aras Agalarov with the Order of Honor, one of Russia's highest civilian awards. After Trump's victory in the presidential election last fall, Goldstone and Emin Agalarov celebrated the results in separate social media posts, with Emin posting a photo of himself, his father, and Trump on Instagram with the message, "The sky is the limit! Congratulations Mr. President." The Miss Universe pageant has been the subject of particular intrigue for months, given the federal investigation into the Kremlin's meddling in the presidential election and the question of whether the Trump campaign colluded with Russian officials, a claim that the president and his associates have denied. Donald Trump Jr. said in a statement Sunday that Veselnitskaya did not provide any information of value about Clinton, his father's opponent in last year's election, during the June 2016 meeting, which took place at Trump Tower. He said the conversation soon turned to the adoption of Russian children and a U.S. law called the Magnitsky Act, which blacklists suspected human rights abusers from Russia. "Obviously I'm the first person on a campaign to ever take a meeting to hear info about an opponent… went nowhere but had to listen," he said Monday on Twitter. It was in the mid-2000s, as the Trumps aggressively sought to license the family name for international real estate projects, that they began coming to Moscow regularly. In 2006, Donald Jr. and his sister Ivanka stayed at the Hotel National Moscow near the Kremlin, coming and going to meet with potential business partners. Joining them on the trip was Felix Sater, a Russian immigrant and longtime associate of the Trumps. Sater, who continued to work with the Trump Organization even after it came to light that he had pleaded guilty to a role in a stock manipulation scheme involving Mafia figures and Russia criminals and has served as a U.S. government informant, told The Times this year that the family's attitude was: "nice, big city, great. Let's do a deal here." Sater worked on a plan for a Trump Tower in Moscow as recently as the fall of 2015, but he said that had come to a halt because of Trump's presidential campaign. Donald Trump Jr., speaking at a New York City real estate conference in 2008, told the audience he had been to Russia a half-dozen times over 18 months. "I really prefer Moscow over all cities in the world," he said, according to eTurboNews. But he acknowledged that the Russian market was challenging, with "an issue of 'Will I ever see my money back out of that deal or can I actually trust the person I am doing the deal with?'" Phil Ruffin, Trump's partner in the Trump International Hotel and Tower in Las Vegas, who flew to Moscow for the competition, said he and Trump had lunch at the Ritz-Carlton with the Agalarovs. "I had a great weekend with you and your family. You have done a FANTASTIC job. TRUMP TOWER-MOSCOW is next. EMIN was WOW!"